Manthey Racing's Porsche 911 GT2 RS broke the production car lap record of the Nurburgring with a time of 6:40.3 last year. Chris Harris drives it in his latest video. For those who have no idea who is Manthey Racing, it is a basically a company filled with people who can make your Porsche GT2/3 RSs even more 'RS'. Partly owned Porsche, the company prides itself as the experts of the Nurburgring and has modified the GT2 RS you see in the video even better for track use. 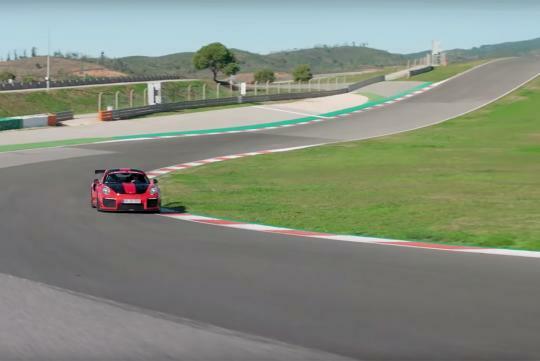 The results are amazing as it beats cars like the Lamborghini Aventador SVJ and the McLaren P1 LM at the Green hell by more than three seconds. Shot at Portimao circuit, Chris Harris has a go in the Porsche 911 GT2 RS which has the MR Performance kit. Consisting of a trick KW coilover suspension, new endplates on the rear wing along with a different splitter, underbody panels, rear diffuser, better brake pads and new lightweight magnesium wheels, it allowed Harris to go faster than he did with the McLaren P1, the LaFerrari and the Porsche 918 Spyder.